A well designed, efficient food servery counter is essential for good customer service –and sales. Which is why we design, manufacture and install food service counters in a range of styles and finishes, specifically for your catering space. Our counters are engineered in moisture resistant MDF and birchfaced ply and all timber is sourced form sustainable managed forests. We also supply food service counters in solid surfaces such as Corian, glass, as well as granite marble and stainless steel. Each servery counter is purpose built to fit your equipment and can incorporate heated, ambient and refrigerated serving stations. We even design bespoke glass and metal fittings to give your counter a unique look and feel. What type of food service counter do you need? The team will take a good look at the size of your catering space; how your counter will be used; and your budget, before recommending your ideal servery counter. Once the size, shape and materials have been confirmed your project manager will oversee every part of the production of your food service counter through to installation. 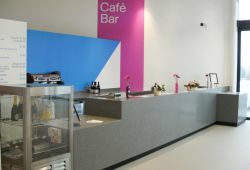 Looking for food servery counters? Call Lewisford on 0208 912 1712.